No, I have not lost all sense of syntax; nor have I, for the sake of brevity, decided to communicate for the immediate future entirely in tabloid-style headlines. In fact, I’m not attempting to comment on the speed of my wifi connection at all. The key here is: which word is the adjective, and which is the noun? That’s right: I’m going on an Internet fast. For the month of November, I have no wifi access at my office. You know how easy it is to be enticed away from the task at hand when, right there on your desk, you have instant access to everything currently known so far about entire universe and everything in it, including all the possible opinions on every aspect of it. And oh, five minutes from now? There will be more new stuff and opinions that weren’t there before! Well. What red-blooded nerdy kid-at-heart could keep away from that bag of Haloween candy? Of course it’s easy to stay on task when things are running smoothly and are themselves lots of fun. But when the going gets rough, the frustrated look for diversion. And that can be counterproductive in more than one way. It’s not just that random googling, rabbit-hole researching, virtual window-shopping, Facebook-checking, Twitter-quipping, what’s-my-ex-doing-these-days-holy-frakkin-A-he’s-bought-himself-a-Tesla eats up time; it actually can steal from you one of your most valuable creative assets. 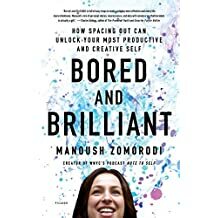 I’ve been re-reading Manoush Zomorodi’s book, Bored and Brilliant. Zomorodi is the creator and host of the podcast Note to Self, and the book is a compilation of and expansion on a series of participatory experiments and investigations that Zomorodi ran on the podcast. That’s where I first encountered the material, and found it all very illuminating. I was glad to hear that she put it all together in a book. Don’t let the cheesy blurb put you off. The idea is that we’ve become so addicted to immediate diversion and entertainment via our devices and apps that we’ve lost touch with the constructive aspects of boredom. Basically, when we have nothing to do, we think stuff up. Our current hyper-connected lifestyle too often doesn’t permit even the briefest empty moment — we fill it immediately with a game, a glance at social media, a swift scan of the news. And that ability is available to us all the time. We turn to trivial entertainment, using up time and bandwidth, and eroding our ability to focus. Zomorodi doesn’t just make assertions and collect opinions on the subject: she’s investigated previous ideas in the area, and checked out the current scientific research on what our brains actually do when we think they’re doing nothing. Plus, they help me understand what’s on people’s minds out in the real world. But I do not have to look at them so many times in a day! Honestly. So: lack of office internet should help to keep the whim-searches under control. I do have my phone, and I have access to the Internet through that — but I don’t have an unlimited data plan, so I have to keep my access down. I’m mainly using it for email, just in case something urgent comes through. One hardship is the loss of streaming music via Pandora or Amazon Prime Music. I do have plenty of mp3’s on my computer, and I can set them running. But sometimes I rather like not knowing what’s going to play next, and the possibility that it might be something that I’ve never before heard in my life. Alas, what to do? Then I remember this thing, called — what was it now? Oh, right: Radio. Turns out I had one in the back of my closet and by golly, it works! I found a local classical station, and it’s quite lovely. Also good for the news. This is an experiment, for the month of November (and if I feel like it, December), and it only holds at my office (where I do spend most of my time). I still have Internet access at home, and my morning ritual includes breakfast surfing, news sites, and Facebook — rather the way my Dad would read the newspaper over breakfast when I was a kid. And should I need to do some heavy-duty research or downloading in the middle of the day, the library is just down the street. Also, Starbucks and Dunkin’. And as for blogging– well I wrote this offline and uploaded it when I got home. And my email sends me a notice when anybody posts a comment. So, we’re covered! Now, from all this, you might have discerned that I’m planning to be especially focused on the book this month; and in this you are correct. My tradition has been to head off to some undisclosed location over the Thanksgiving week and weekend, and have a bit of a writing retreat. Being in an unfamiliar setting can be refreshing and invigorating. But this year, I can’t afford to actually go away. So, I have to refresh and invigorate myself by sheer force of will! An Internet fast can’t hurt. In other news: Saw the movie First Man. with my sister, and our pals R. and J. (You know who you are.) Loved it. I’ll say more later (this is getting too long), but I wanted to say right off that if anyone tells you that the American flag is not shown on the moon, don’t believe them. It’s right there, in several shots. What’s not included is the specific moment of planting the flag. But the flag is there, despite what other people might be telling you. I’ll say more in a couple of days; I’ve run out of time tonight. This entry was posted on Monday, November 12th, 2018 at 4:08 am. You can follow any responses to this entry through the RSS 2.0 feed. Both comments and pings are currently closed. Good luck and great writing. I hope you will report on the success of the experiment?